Have you ever wondered what it really takes to be organized? Tips and ideas abound for getting organized, but how do you stay organized once you get there? The answer is by setting up simple organizing systems that think like you do, and creating the habit of using those systems consistently. Set up a reminder in your phone to process the mail at the same time each day. Use labels to remind you where items belong in your freshly organized space. Put a sticky note on the mirror in the bathroom to remind you to declutter your spaces before going to bed. Ask a family member or spouse to help you remember to take your new actions. What types of reminders have you used to create new habits in the past? I’d love to hear your ideas in the comments below. Did you know that dryer sheets are super toxic and can actually leave a film on the lint trap in your machine that can cause a fire? I didn’t know before someone told me, but then I read up on it and have never used them again. I get that the static is annoying though, but there are alternatives without the harm. Your advice for creating reminders is spot on. Such a simple trick. I need to set up reminders for myself to drink more water throughout the day. Thanks for sharing, Elizabeth. I hadn’t heard that info. Truth be told, it’s my son and I that are wanting the static to be gone. It’s not so fun having static in our workout clothes. I’ll do some research and see what I find. We like green alternatives whenever we can find them. I use wool dryer balls. You can find them on etsy and Amazon. 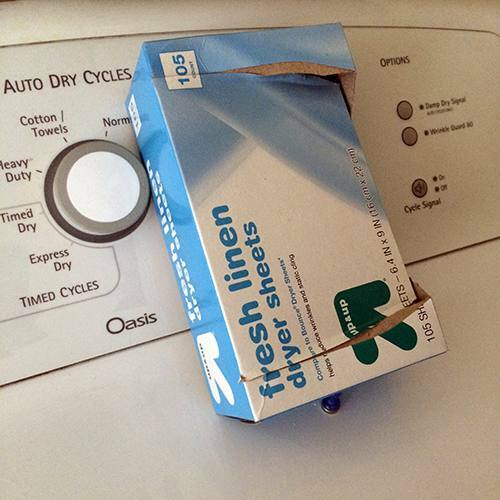 They stay in the dryer so I don’t have to remember to add anything and can avoid the toxic chemicals of dryer sheets. I also add a half cup of white vinegar to the softener dispenser during the wash. I used to keep the vinegar bottle on top of the machine until I had the habit established and then I moved it to a cabinet. Unfortunately it’s too tall a bottle to fit in the cabinet over the washer with the detergent. That would have been the easiest way to remember. The vinegar acts as a softener according to what I’ve read online. I do occasionally still have problems with static, but that is usually only during the worst of winter and because I have over dried the clothes. Between the vinegar and the dryer balls my clothes are as soft as when I used to use liquid fabric softener and dryer sheets. The cost is a lot less than fabric softener. Also, vinegar helps with mildew odor. My towels never get a musty smell, which used to sometime happen with fabric softener. I also never have a problem with odor in my HE machine. I’ve read lots of complaints on line about people unhappy with their HE machine because of mildew. I also keep the door ajar when it’s not in use so that helps too. Why don’t you see if you can find a small bottle of vinegar or recycle a bottle that fits and label (maybe even pull off the label on an old vinegar bottle), then you would be able to remember. Refilling as needed from the larger (more economical) bottle. Such a small change yet a good result. Nice idea Aby! I have a reminder on the washing machine to go check certain areas for items that could go in with the same load. I must admit though that this reminder sort of becomes part of the decor. Maybe I should put it inside the basket I keep the different detergents in. If I put it on top of the detergent itself, I will definitely notice it ;-). For recurrent tasks, like giving the dogs their heart worm medicine and tick treatment, I’ve used a yahoo calendar and have set it to send me a reminder email the first of every month. It’s worked like a charm for years. Another app I like for setting reminders is AnyDo. I love Followupthen.com to receive email reminders because it is so flexible. I can set a reminder for 5 hours and/or five years from now. You can have a message sent at a specific date and time or just type in “tomorrow.” You can set it to email you in as little as one minute too. So funny – I was going to write that dryer sheets are gross, but Elizabeth beat me to it. Lots of them are made with beef tallow, which stays on your clothes. Seventh Generation and others are made with plant-based materials, so they’re good. I use the wool dryer balls and they stay in the dryer, so no need to remember. Vinegar is good, too, but get the natural vinegar and not the ones made from petroleum, cause, again, yuck. These are the ones that Carrie Vitt on deliciouslyorganic.net uses. They’re in my cart, but I haven’t ordered yet. I actually use reminders to help me remember to pick up my children. I have three different school pick ups, only 45 minutes apart… Which is just enough time to get started on a project and caught up in it. Not exactly related, but it is a sort of reminder. Sometimes there are things I need to do during the course of the day that require stopping at a certain location. I put some sort of reminder on the dash of my car on driver’s side. Often it is just something small I need to return so I put that item in the window. Once I had several items to return to the same person so I put the smallest in on the dash to remind me to return stuff. When there’s something I need to take with me or do as I leave, I often place it right in front of the door so I can’t open it without moving the item. This works for things I need to take in the car as well as the large empty Amazon box that needs to be carried to the trash as I leave the house. Sometimes I just hang a grocery sack on the door knob. That works too. WHAT are dryer sheets? Is that a North American thing? I mean we obviously have dryers in Scandinavia but I’ve never heard of those? I use dry erase markers on mirrors. No need to keep stickies around. I have mirrors all over the house, but mostly use this tip on my bathroom mirror. Have a Monday morning appointment to remember? Put a note on the mirror. Need to do something at bedtime? Write a note. These notes won’t fall off with steam, and it gives you an excuse to wipe that mirror.